Description: Finally! I am back with an exruciatingly long render. Fish made in Wings by me, 3 days of work there. Made a stand (I really don't like it, it was better the first time) in Bryce, and rendered with Beanvision's Lightdome and Soft Shadows. 7 days and 90% through, my computer crashed, making me lose this and another long render (I lost the scene files for both, too!). This was a mere 4 day render without soft shadows. Please exuse the stand (if you don't like it, I can send you an improved scene file, and you can render it). I love it. Very cool, I wonder why it takes you so long to render. What kind of computer do you have? I wonder if the power of your computer has anything to do with it. Not crazy about it on a stand tho. Amazing work in Wings! Now give it a texture or is it supposed to be that way. This is in the unfinished section. Yeah, light dome and soft shadows makes every computer take a deep breath, or more then one. 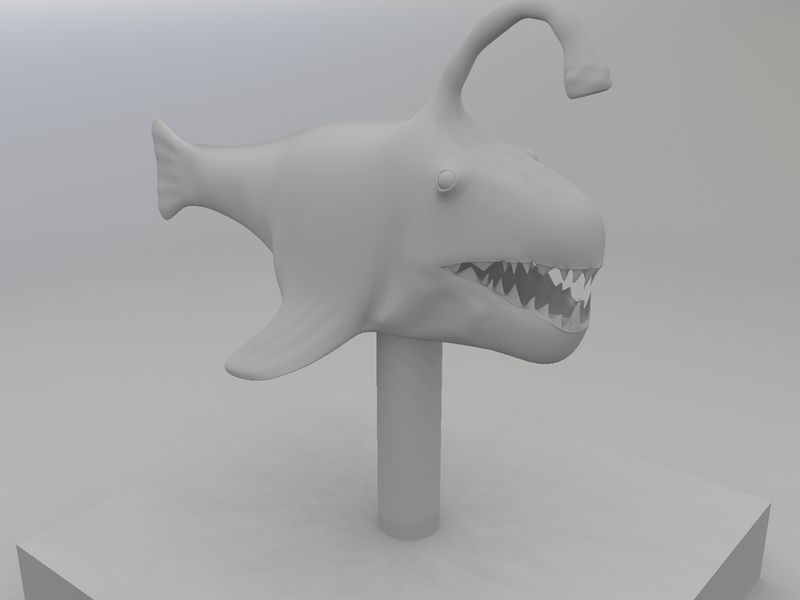 The fish is not textured for one not-so-good reason: it is all one object (exept for the eyes- they are spheres). It was modeled out of a single cube. I have a texture for it, but I really don't want the teeth to be the same color as the body. To make it more than one object would involve hours of loop cutting and bridging. I am still working on the fins, can't seem to get a good fin going. If any of you would like the .wings file, I can email it to you as a lowpoly or highpoly version. Perhaps David could improve it a little? Yes, the stand ruins the effect, but I noticed that after I had started rendering. Perhaps another five days of not being able to use my computer? My computer is a reasonably powerful emachines laptop. I see what you mean regarding texturing it So, it's a model. But why not in gold instead of chalk? The eyes could be done as reflective glass, the stand in wood. Just a suggestion.